Carl Peter MacLaurin, Past Master of the Connecticut State Grange, Past Voting Delegate to the National Grange and member of Cawasa Grange No. 34 passed away on March 11, 2007. Long-time family and Grange friend Lin Erickson offers this tribute to her (and our) friend "Bud." Back in the 1950's we used to take our horse and buggy down on the old railroad bed that ran behind the houses on Dowd Avenue. It was there that we first met the MacLaurins. They were newcomers to Canton and eager to meet people and join in community activities. In those days of one car families, the action was usually in the local churches or in Grange. Bud, Gerry and Jim decided to join the Grange and became the mainstays of our order. Bud also became active in the Canton Volunteer Fire Company. Through the years, we worked together on suppers, dances, and floats in local parades. Bud always was willing to cut a few trees for stage or truck decorations when needed and knew how to pull things together. Bud and Gerry both became officers of the Grange and it was soon very apparent that Bud was excellent in degree work. For many year≠s, he did both the 2nd and 4th degrees at Cawasa and for other Granges whenever asked to help. When my Dad was ill, Bud and Gerry came on more than one occasion with meals. Gerry would stay with Dad to give Mom a chance to get away for a while and Bud was out doing whatever needed to be done in and around the barn. When a widow down the road was struggling, it was Bud who was shoveling her driveway after a snow storm. Always quietly helping wherever they were needed. There were times that it was difficult to understand Bud - not just his Maine accent. We all handle things differently. He bore his burdens silently within. He had a little helper when he planted his garden one year. The following year as he planted, he watered his garden with tears. His little helper was not there. He showed little emotion when the family lost Bonnie, but his pain was very deep. Bud loved and was very proud of his family. Through the years, it was Bud's car that carried people to Granges around the state and beyond. When it was "Kissin' Cousins" or chasing after the "gimmick" or "banner" it seemed that we were out several nights each week. Many picnics were held in the MacLaurin's back yard. Gerry did the cooking while Bud slowly and quietly made sure everyone was having a good time. Cawasa Grangers went to Camp Berger for a weekend each fall. What fun we had as the men brought out a boat or a canoe or two. In the evenings we chatted and played games while Bud played cribbage with Mom. One time, the Pomonas had a softball competition and Farmington Valley played against Mountain County. I could run in those days, but it was Bud who led our team. Maybe not to victory, but we at least were able to hold our own. When Frank Prelli became State Master, Bud was chosen as General Deputy and was affectionately known as G. D. MacLaurin. Shortly after, Bud started the climb through the chairs toward State Master. Gerry beamed as she stood by him each time he was installed in the next step. They walked together until just before they were to reach that high office, Bud lost the love of his life. 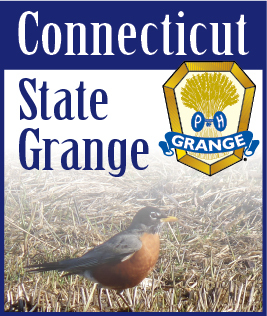 How easy it would have been to step aside, but in her honor, he stepped up to become a very fine Master of the Connecticut State Grange. Through his love of golf, he met Jeannette Ryan. She was a wonderful companion to Bud and helped him through his Grange obligations and activities. Bud was quietly proud of his Gold sash. His last official duty was to honor me as I celebrated 50 years in the Grange. When I asked him, he agreed, and said "I suppose I should wear my gold sash for such an occasion". He wore his favorite red and white striped shirt and red jacket. How many times, as Assistant Steward, Bud walked the path to the charter and altar to honor those who went on before. Now, it is time for us to walk that path to honor him. I believe that he most certainly deserves to "receive that welcome plaudit; "Well done, good and faithful servant.